MainAll NewsForeign AffairsFatah: How dare UN Chief speak of Jewish Temple in J'lem? Fatah: How dare UN Chief speak of Jewish Temple in J'lem? Fatah leader attacks new UN Chief António Guterres for saying that the Holy Temple in Jerusalem was "Jewish." 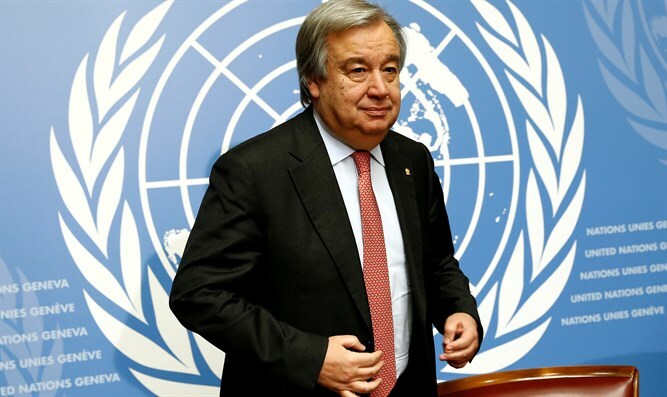 United Nations Secretary-General António Guterres said on Saturday night that it is "clear" to him the Holy Temple destroyed by the Romans over 19 centuries ago was a Jewish Temple. He made the remarks in an interview with a reporter from Reshet Bet, a Voice of Israel radio channel. Fatah did not tarry in responding with fury. The Deputy Secretary of the Fatah Revolutionary Council, Faiz Abu Ita, appeared on Palestinian Authority Television shortly afterwards and said that this declaration is "infuriating" and "unjustified" from "ethical, humanitarian, and political" standpoints. Abu Ita went further and said that such remarks are a "direct attack on the Palestinian nation [sic] in Jerusalem" and are a "display of admiration for the occupying power." Although Arab spokesmen have taken to denying the Jewish People's historic connections with their Holy City in recent years, it wasn't always this way – and in fact, even Jerusalem's Muslim Waqf does not agree with this groundless claim. Back in 1925, the Supreme Moslem Council – i.e., the Waqf, which has overseen Temple Mount activities on behalf of Islam for hundreds of years - boasted proudly that the site is none other than that of King Solomon's Temple. A copy of the booklet in which this claim is made is in the possession of the Jerusalem-based Temple Institute. On page 4, the Waqf states that the Mount's "identity with the site of Solomon's Temple is beyond dispute." It then quotes the Biblical book of Samuel II indicating that it is also the spot, "according to universal belief, on which 'David built there an altar unto the L-rd...'"